We love providing insight, wonder and joy. By the way, the piece about belief in heaven to which you allude was written by Mrs. Lapin. Thank you Susan, Daniel, and Team! I got it as a gift and I have been reading it almost every day! 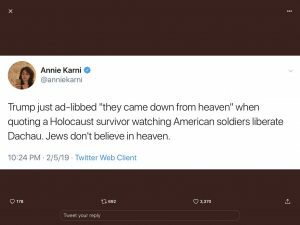 Can I ask, about how the Jew people believe they get accepted into heaven? Or where in the Bible it covers this? I’ve only learned Christianity. And in general, ones who’ve really studied the Old/New Testament believe that you need to accept Jesus as your savior in order to be accepted into heaven. Also, if this has been covered, then maybe a link to it? We humans are partially material, physical bodies and we are also spiritual. Physical things like computers, guitars, and bodies can come to an end, eventually decomposing over time. Spiritual things like software, tunes, and souls can never end. Heaven is where souls hang out. Hope this necessarily simplified answer helps. How DARE she mock that elderly man! Must she drag everything that is holy and sacred through the muck? Including elderly people who have already gone through so many horrors? I realize her intention was to make Trump look the fool, but to so disregard the feelings of that elderly gentleman is beyond belief. It’s a good thing I am not her mother! Were one of my young children to grow up with such disrespect, I would march myself straight to her office, and give her the spanking of her life! well said! And please don’t hold back on our account! I am only sorry that her mother did not parent as effectively as you. It makes all the difference. First of all, I love this website and I admire you Rabbi and Mrs Susan Lapin very much. And I thank you for clarifying this matter, as this has been one of my many questions.